The Federal Government has required carbon polluting electricity generators and heavy industries to surrender a set number of Renewable Energy Certificates (RECs) every quarter. These 'liable entities' may either purchase RECs from 3rd parties or install their own renewable power generation facilities to create them themselves. This has created an emerging market for Commercial Solar Systems (10kW to 100kW) of grid connected photovoltaic (PV) systems installed on the roofs of various commercial establishments like warehouses, office buildings, shopping centres and local council buildings. A commercial establishment based in Smithfield, New South Wales decided solar power could be an efficient way to supplement their power requirements while helping trim their operational costs. But they needed a partner to help them execute the plan. Enter Regen Power, which scoped the project, offered a tariff, arranged financial options in addition to conducting a feasibility study, designed, supplied, installed and commissioned the solar system. Regen Power proposed a customised design with 400 x 250Watt solar panels situated across approximately 1000 sq.m of roof space. In addition to these solar panels 6 x SMA Tripower 17000TL German made Inverters combined with ComAp's Mains Promains protection unit and Solalog remote monitoring system were used in the system. The Smithfield 100 kW installation is estimated to generate around 157,000kWh per annum based on historical climate data. Regen Power is able to provide an up-front discount in the form of STCs on solar PV installations and solar farms up to 100kW in size. Much of the upfront cost of the installation will be recouped in about 2 years taking into account of new electricity tariff agreement that Regen negotiated on behalf of the client and depreciation of 30% of the system value in the first year. 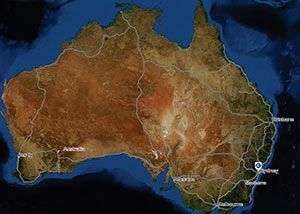 Regen made sure that the project strictly followed the Energy Nework Associaion (ENA) of Australia guidelines for the connection of Embedded Generation within distribution networks. The MainsPro protection system installed in this project provides adjustable voltage, frequency and loss of mains (islanding) protections. Regen Power had previously installed hundreds of residential solar power systems using Hanwha/Solarfun solar panels. The modules are supported by a 25-year warranty and are certified by TUV, CE, UL, and CEC worldwide certifications; along with meeting all Australian and European quality and safety standards. Performance warranties on modules available in Australia through Regen Power carry a 97% nominal power generation capacity (poly crystalline based PV modules) with an annual output degradation of no more than 0.7%. In order to capture the most solar energy, the solar panels should be oriented to north at around 30 degrees off the rooftop surface. However, considering the wind loading and strength of the roof, the panels in this project were oriented directly facing up. Regen used Australian approved Clenergy PV-ezRack Solar Roof universal roof mounting system in this project. The monitoring system can process and analyse plant data with the help of the Solar-Log™ data logger. This can be done either in graphic or numerical format in the form of daily, monthly and annual data reports. In addition to the yield line and input voltage, individual strings and inverters or environmental data associated with plant monitoring can be presented with the help of the Sensor Box as well as other reference values. Our monitoring system supports the "Full Service" maintenance concept through online access to the plant. 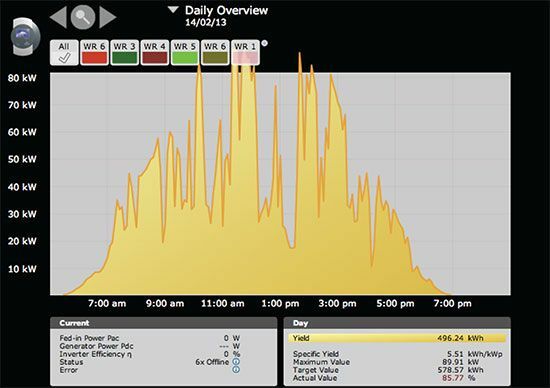 The monitoring system not only measures and compares the yield data of the individual strings, but also the performance data of the individual inverters. Regen can enter into a maintenance contract with the plant owner – we offer the customer complete package with monitoring, maintenance and servicing of the solar power plant. Total Site Annual Consumption (CO2e) = 122 tonnes CO2e. This is the equivalent carbon footprint of 25 x average NSW household's annual electrical consumption, or consuming 50,250 litres of petrol in a vehicle per year.